Well, what do you know. The soon-to-be-history Government Accountability Board and their hackneyed John Doe investigation of Wisconsin conservatives had me in their sights all along. Included in these emails are pdfs of my tax returns. All my personal health records and those of my oldest daughter. Credit card and banking statements. In short, they sought and (thanks to a Judge who didn’t scrutinize the request) they received everything emailed by or to me for nearly four years. All over a suspected violation of campaign finance law, which has subsequently been determined by the court to be based on a flawed interpretation of state law. Perhaps I should have seen it coming. 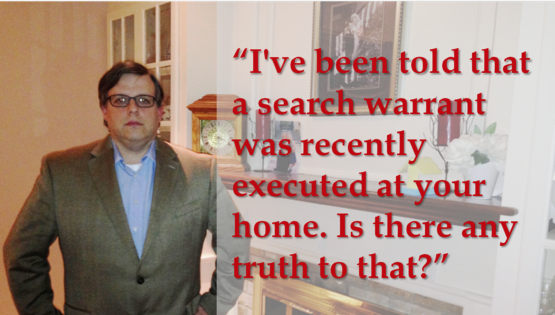 In November of 2013 a reporter contacted me to inquire whether a search warrant had been executed on my home. It had not. I wrote about it here. At the time, I posited that perhaps the reporter was simply fishing, dishonestly probing for information. I owe Jason Stein of the Milwaukee Journal Sentinel an apology. He clearly had some info leaked to him. The facts were off, the leak was illegal, but he was just doing his job, tracking down leads. Not only was the prosecution of this matter deemed to be unConstitutional and not based on Wisconsin law, the prosecutor’s actions have proven to be inept. 1) Part of what they asked for were my MacIver emails from 1/1/09 to 10/19/13. They sent letter to MacIver about this last week. But I have not been employed by MacIver for more than two three years. One would think an investigator with unlimited taxpayer resources and staff in five counties could conduct a simple Google search to determine as much. I was not informed. Schmitz sent a letter, addressed to me, at a former employer. Thankfully, after Christmas break, that employer let me know about it. 2) The prosecutor failed to meet his obligation to describe for us “…with particularity, the nature and scope of the documents or electronic data that the prosecution team obtained, and from whom the documents and/or electronic data were obtained.” Mr. Schmitz’ letter merely cut and pasted from a search warrant authorized by Judge Kluka (who bailed on the case right after authorizing the warrants, by the way). The Supreme Court told Mr. Schmitz to inform me (with particularity) of what was obtained, not what was requested. He plainly failed to do so. 3) The scope of the warrant should leave no doubt in anyone’s mind that this probe was nothing more than a fishing expedition at best and a witch hunt at worst. It covers a time period of four years, including from months before the MacIver Institute even existed (it was launched March 4, 2009), and four months before I was an employee of the think tank. Now, the John K. MacIver Institute for Public Policy and myself in particular have been among the vocal (and, I’d argue, effective) critics of the soon-to-be-defunct Government Accountability Board. My research and reporting have exposed the GABs shortcomings and their political agenda. Again, these are all details are widely available in the public domain. The sweeping nature of the warrant is prima facia evidence of both the temperament and efficacy of the prosecutor and the dereliction of duty of the original John Doe Judge to carefully review and consider his requests. Why would the GAB want to go after me? On behalf of the MacIver Institute, I filed an open records request with John Erpenbach and three other state senators seeking “Copies of all correspondence you have received or sent, (including, but not limited to, letters, emails, voice mails, records of phone calls, and logs of in-person meetings) regarding the subject of changes to Wisconsin’s collective bargaining laws for public employees. This request covered such correspondence received or sent between January 1, 2011 and March 23, 2011. At MacIver, we reported on the Capitol Chaos and wrote critical opinions regarding those who fled the state to advance a political cause. Our actions were Constitutionally protected free speech, but apparently put us in the crosshairs of powerful officials who didn’t like that speech. MacIver filed a complaint against Senator Erpenbach in Grant County Court regarding the Senator’s failure to comply with the request for records. Case is originally referred to as Fraley v Erpenbach. I left my job at the MacIver Institute to become Managing Editor of RightWiscosnin.com which begins publishing original content on January 29, 2013. I maintain honorary title of Senior Fellow at MacIver. But most of my criticisms of the GAB are then published at RightWisconsin. In addition to the articles and columns linked above, the MacIver Institute (and later RightWisconsin) routinely reported on the ineptitude of the GAB. From their bungling of routine tasks to their thwarting legislative intent to their obvious partisan bias, I and the organizations for which I worked routinely exposed the failed state agency. So what the hell, the GAB may as well cast their fishing net wide enough to include me, right? Yes, this entire probe was a political witch hunt. And although the Right was targeted here, it’s not merely conservatives who should be troubled by this abuse of power. Attention Wisconsin reporters, all my email communications with you over those four years were also obtained. How would you feel if the government seized the tools you use to do your job and all of your off the record communications? Liberals, are you comfortable with such prosecutorial overreach? How comfortable would you be if four years of your communications were in the hands of your ideological opponents? My privacy was violated. My property is still in the hands of the government. Four years of my life scooped up two years ago and poked at, prodded. Was it shared? With whom? Over an investigation into possible campaign finance violations which, as it turned out, were based on a flawed legal theory later shot down by multiple courts. All this happened more than two years ago…and I had no idea, until yesterday. This disgusting chapter of Wisconsin politics needs to end. Good men and women of all political stripes should not fear prosecution over engaging in political speech or investigative journalism. Not in the United States of America. That will teach you, back to your hot dog stand you are obviously a dangerous threat to the Republic. I’ve followed this story – from a thousand miles away – for some time now. On its face and by its name, one would think that “Government Accountability Board” would be a necessary and proper thing in a supposedly open and responsive government. We should all have “Government Accountability Boards”, shouldn’t we? That is, until we see what “government accountability” means to some people, and how it responds to those who responsibly – even if pointedly – question its motives and actions. Yeah, but here’s the thing, Darrel. After millions of dollars and combing through 4 years of emails of up to 159 people, this came up with zilch. It was based on a flawed theory that even if proven, would not have revealed any illegal activity. That’s according to the John Doe Judge. It’s too bad you’ve let your Walker hatred blind you to the abuses of the government here. Becareful what you cheer, someday someone in authority could abuse their power and put you in the crosshairs. And then letters get sent to Emerson Electric Co. or ASTAR Air Cargo even though you’ve done nothing wrong.